the majority of my previous posts regarding endurance sports and kung fu have attempted to present my observations regarding similarities and differences between the 2 areas, and the ways in which they could complement one another. for this post on functional strength and flexibility, however, i decided to just focus in terms of how kung fu helps with endurance sports--largely because that's how i see it; i don't (or so far have not) seen much in the opposite direction. in fact, i've been finding that my functional strength and flexibility in endurance sports has been getting a whole lot more from kung fu than vice versa. if anything, kung fu training actually seems to be rectifying all the problems associated with (or caused by) endurance sports. as i've mentioned elsewhere, endurance sports--especially when dealing with longer distances--is an exercise in repetitive motion injuries; it's never a question of if you will get them, it's when. and every season generates its own crop of nagging aches and pains. as a means of preventing these problems, there's been growing support for "functional strength" or "functional flexibility" training. these terms tend to deal with theories arguing that currently dominant modes of training, rather than building the body's capabilities (and hence resistance to repetitive motion injuries), instead serve to create systemic imbalances in muscles, bones, joints, and connective tissue (and thereby create stresses that actually encourage repetitive motion injuries). in effect, current training methods are not allowing athletes to "function" at an optimum state for athletic performance. functional strength and functional flexibility training espouses that a more effective training approach is to involve athletes in methods that build the body's capabilities in a performance-based setting, so that the training gains help the athlete's ability to "function" for athletic performance. examples of the dominant paradigm of training include static, non-dynamic weightlifting and high-volume (either in effort or repetition) practices. examples of functional strength and flexibility training include new routines involving inflated plastic balls, balance pads, and elastic cable work. the last article is the relevant one for the purposes of this post. while it deals with the advantages of single-leg exercises, it refers to a lot of concepts and ideas regarding the notions driving functional strength and flexibility training. in particular, it points out that the purpose of such training is to enhance physical performance of the body, which in sports requires physical motion across a broad spectrum of movements in a wide variety of scenarios. this means improvement of body mechanics in dynamic, unpredictable settings, with muscles, bones, joints, and connective tissue operating through differing angles, multiple planes of action, and ranges of motion. When looking at lower body biomechanics in endurance-based sports, we can easily see that much of the time force production is being generated by a single leg. Both running and cycling are skills requiring force generation in this manner. Our operational environment compounds this independent nature of lower body endurance sport mechanics. By operational environment I mean, physical laws such as inertia, momentum and impulse, which are minimized in traditional strength training. These components must also be dealt with throughout 360 degrees of freedom and must be taken into consideration if we want to perform optimally. Since we know that specificity of training is the driving principle behind performance enhancement methodology, it would only make sense to take into consideration the simple observations discussed previously. If most of the force generation in endurance sports involves unilaterally biased lower extremity positions (one leg at a time), multiple joints, dynamic and multi-planar stabilization, and ground based force production, shouldn’t these be the driving principles behind lower body strength development? Looking at the kinetic chain in action allows us to see how ground reaction forces are transmitted through the lower body and the core to facilitate fast and powerful movements. The various body angles that result from the manipulation of momentum require that the endurance athlete be able to produce force on a single leg concentrically, isometrically and, most importantly, eccentrically. The dynamic multi-planar environment of endurance sports also demands that a single leg apply the force in a proprioceptively driven manner. In plain English now, the ground-based leg has to control forces while the joint angles in the leg are continuously changing in all three planes of motion. This type of lower body training is rarely addressed in traditional strength training methodology. Instead, this type of work is usually limited to rehabilitative applications. So what does all this technical mumbo-jumbo mean to the endurance athlete? It means that single leg training should take a priority position in strength training for endurance sports. It also means that the traditional strength paradigm that has kept most endurance athletes out of the gym is outdated and less than optimal. Single leg squats, lunges and step-ups are a good start, but don’t stop there. Think about the varying angles that the leg sees and the forces acting on it (i.e. off road, construction, sand). Notice the position of the foot while the force is being applied to the ground. This means that you have to learn how to apply force while the foot, knee and hip are loading or unloading, in all three planes of motion. i originally thought most of my endurance sports training followed these principles. under guidance from my coaches, friends, and whatever reference materials i followed, i seemed to incorporate training that i thought involved multi-angle, multi-planar, dynamic movements. however, based on my history of repetitive use injuries, this apparently was not the case; based on my comparison of training methods to the ones described in sources like the ones above, this most definitely was not the case. from what i surmise, a lot of my training (particularly in technique work and weight training) were isolation exercises that reduced or eliminated multiple angles, multiple planes of motion, and dynamic movement. which brings me to kung fu. i know there may be skeptics, but i will repeat this to anyone who is willing to read or listen: kung fu helped my athletics. a lot of the repetitive motion injuries i struggled with have seemed to resolve themselves and gone away, and a lot of the nagging discomfort in my body (muscles, joints, bones) seemed to have done the same. i can feel a greater level of physical coordination and mind-body awareness, particularly in terms of neuromuscular motor activity (i.e., volitional body movement). i think the reason behind this is that the kung fu i've been learning has effectively served to give the training i should have been getting but didn't. that is, it's given me the functional strength and flexibility training i should have been getting: multi-angle, multi-planar, dynamic movements. i should point out that these results may be dependent on the type of kung fu i've been learning. there are many styles of kung fu (trust me, many, as in so many it's almost hopeless to try and name them all), with varying philosophies, modes of movement, and methods of training. the ones i've been learning are the styles connected with northern China, particularly those that are commonly perceived as "soft" styles in the West. specifically, i've been learning 2 "soft" styles (bagua zhang and tai chi) and a "hard" style (long fist). the training i've gotten in these styles have called for remarkably intricate, subtle movements demanding balance, flexiblity, coordination, awareness, and constant variation that i as an endurance athlete was not familiar with--usually, in endurance sports, you lock your mind into the proper technique and just repeat it like a metronome; in kung fu, you have to move in constant awareness of yourself and your surroundings, and in a way that adapts to constantly changing variables and conditions. the net effect is my body having to move in all sorts of different (and seemingly bizarre) ways. without getting into details about kung fu styles and terms like northern long fist, tantui, bagua zhang, or palms, suffice it to say that by looking at these videos you can clearly see the types of movements that are stressed so heavily by functional strength and flexibility training. in tantui, you can see a lot of double-leg and single-leg movements applied in dynamic, multi-angle, multi-planar orientations. in bagua, you can see the same orientations, but with an added element of twisting and turning. this is why i think kung fu has served to provide the training prescribed by functional strength and flexibility methods, and why it's helped me obtain so many of the benefits predicted by such methods. 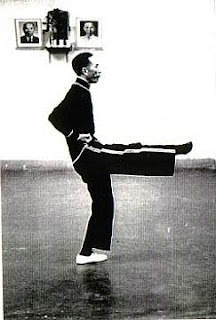 the article on taiji quan (tai chi) doesn't match the videos i have on bagua zhang. but while being separate styles, tai chi and bagua zhang are both considered "soft" styles, and both tend to yield the same benefits...that, and i've started studying tai chi as well, so what i've been saying for bagua zhang and long fist also applies to tai chi. of course, i'm not going to advise anyone to start learning any random kung fu style. some styles are very likely not compatible with endurance sports training (especially Ironman)--i'm referring to more physical, force-driven, high-intensity styles, which would likely only serve to give workouts tantamount to zone 5 anaerobic threshold training sessions...these are good for endurance sports, but only in small and highly discrete doses. the best styles, at least in terms of assisting endurance sports (and sport in general), are those that complement aerobic training requirements without overwhelming the needs or goals of a clearly thought-out workout schedule. having said this, i'm going to repeat the message i've been giving to everyone in person: people should give this a try. i can't say it'll work for everyone; but i can say it worked for me. Awesome post. I agree that kung fu tends to help endurance sports more than the other way around, but i don't think it's entirely a one-way street. My aerobic base has been a benefit both in sparring and long series of forms. Probably worth mentioning that Bruce Lee was a proponent of running.